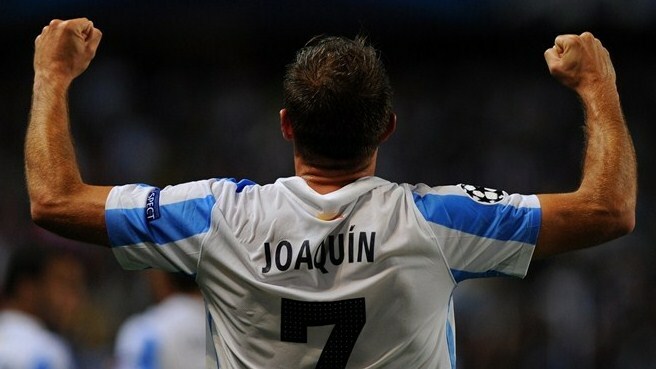 Valencia emerged victorious from an open and enjoyable game at the Mestalla on Saturday evening. Athletic started brightly, playing at a high tempo and at a level much closer to the side which performed well during last season. Key players such as Muniain and Herrara are back in the side, close to full fitness after injury. There was a greater sense of urgency to their play and with Herrara providing the link in midfield, reducing the temptation to always go long, there was a better balance, structure and variety to their attacks. Valencia gradually settled and would eventually go on to dominate possession with 55% compared to Athletic’s 45%. The key moment in the game was the sending off of Ander Herrara after 66 minutes which enable Pellegrino to make more adventurous substitutions and forced Athletic onto the back foot. The concession of two late goals would normally raise a degree of consternation yet Bielsa declared himself happy despite the defeat, in doing so acknowledging that this was possibly the best that Athletic had performed all season. There seems to be a constant discussion on Bielsa’s decision to select Aduriz ahead of Llorente to the extent whereby Bielsa commented on the performance of Aduriz on Saturday evening. Lost within this discussion is the fact that Aduriz has already scored eight goals with season, two of whcih arrived at the Mestalla. 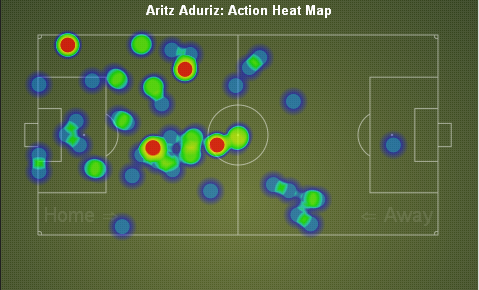 The heat map above shows Aduriz’s movement around the pitch. He is much more mobile than Llorente and able to close opposing defenders down quickly which was one of the reasons for the livelier start from Athletic on Saturday. They pressed and closed down Valencia who were unable to develop any pattern of play particularly due to both Gago and Costa sitting deep and Jonas not really being involved. The flip side of this argument is that Llorente is technically superior and with a greater physical presence, ideal for using as a target man. Athletic still persist with going direct to Aduriz at times. Despite being involved in 9 aerial duels on Saturday, Aduriz only won 2 of these. 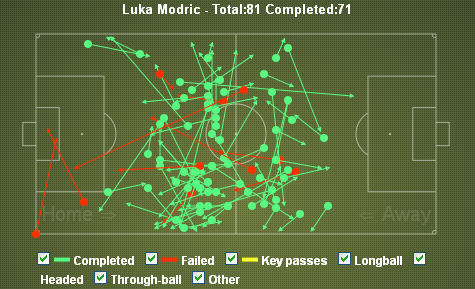 Athletic need to play more short passes to him as he is unable to hold the ball up as well as Llorente. The return of Ander Herrara to the Athletic team has provided a much needed boost of creativity and composure to the side. Without Herrara proving a calming influence in the midfield alongside the energy and industry of De Marcos and Iturraspe, Athletic are too direct and one dimensional. Herrara moved laterally across the midfield area, providing an outlet for team mates under pressure and generally recycling possession. His short and long range passing enables the team retain possession although Athletic are still toiling in this regard this season. 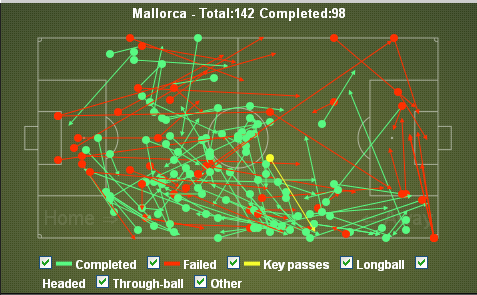 Their pass completion rate on Saturday evening was just 67% as they conceded possession too easily and much too often. Yet all his good work was undone when he was red carded following a moment of stupidity, kicking out at Tino Costa. From that moment, the initiative, although already moving in Valencia’s favour, went completely towards Los Che. Athletic moved towards a 4-1-4-0. Aduriz was withdrawn and Aurtenexte came on. This resulted in the young Basque moving to his favoured left back position and Inigo Perez moving into midfield. De Marcos became the default attacker, looking to break forward from midfield when Athletic had possession. The formation led to Athletic falling deeper as the second half wore on with Valencia enjoying a significant territorial advantage whilst seldom appearing to cause great concern to Iraizoz in the Athletic goal. Valencia – A Work in Progress? With ex-player Mauricio Pellegrino now in charge at the Mestalla, the side remain a work in progress as he attempts to install his philosophy on the team. Retaining the same shape as his predecessor Emery, Pellegrino has set this team out in a 4-2-3-1 formation. There are of course, a couple of differences. The loss of Jordi Alba to Barcelona has been a huge blow. Individually, a superb player but collectively his loss is acutely felt on the left side where he had developed an excellent relationship with Mathieu. Athletic attacked the Valencia left early on and managed to carve out some half chances before the opening goal was scored when Muniain delivered a pass on the inside of Mathieu. The Frenchman managed to get a foot to the ball but could only divert the ball into the path of Aduriz who calmed scored with a lovely curling shot. The problem against Athletic is that ahead of Mathieu was the attack minded winger, Juan Bernat. His natural inclination is to move forward leaving Mathieu exposed which is exacerbated by Athletics’ tendency to overload their right flank. Guardado would provide more support but was benched after international duty with Mexico. The second Athletic goal should be a concern for Pellegrino as the defence of a corner was extremely poor. The ball dropping onto Aduriz who knocked the ball in with Guaita stranded. Whilst the acquisition of Gago has the potential to be an upgrade on the departed Mehmet Topal, much of his work is done defensively and performing a similar role to Tino Costa. Without Ever Banega in the team, the balance is not quite right. Returning from a long, and self inflicted, injury, the brief appearance by Banega demonstrated why he is so important for the side. Completing 11 from his 12 attempted passes, the Argentinean has the ability to unlock defences with his accurate passing.